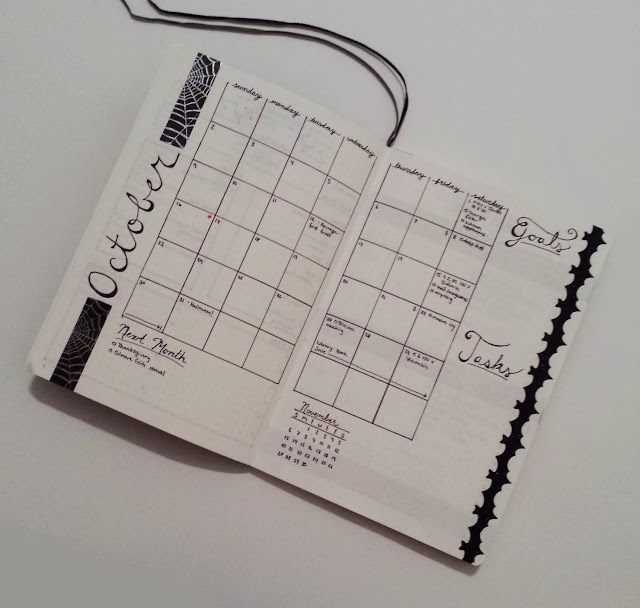 September is almost over and it's time to start creating those October monthly layouts! I'm embracing the Halloween spirit fully this month and using Halloween-themed washi tape on all of my monthly layouts. You've gotta love what you can find in the dollar aisle of Target! 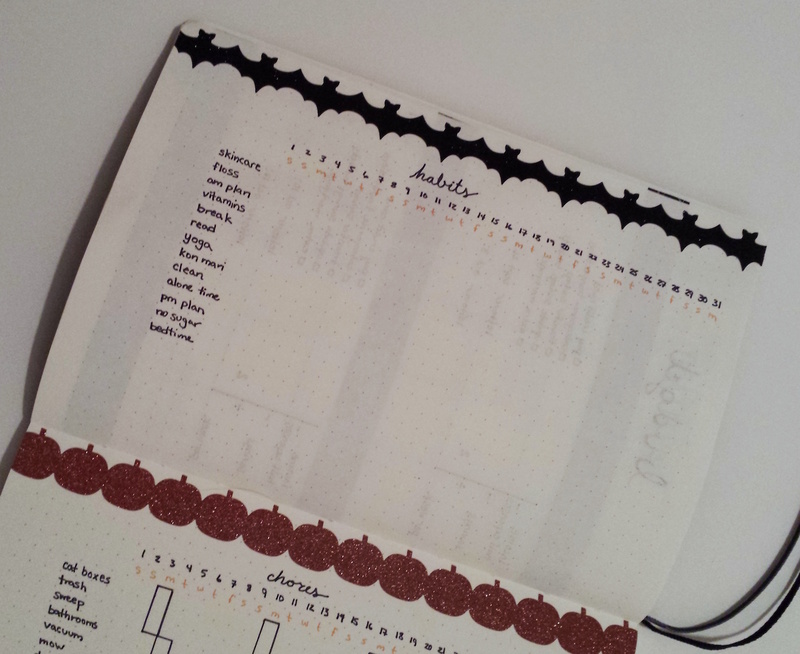 For my October monthly layouts, I've only tweaked one or two things. First, I'm trying out a grid view for my month overview spread rather than the traditional list view. When I've used the list view in the past, I've always had trouble trying to visualize where the weeks fall. I've tried drawing a box around the weekends in previous monthly overviews, but I think the grid view will better match what my brain expects a month to look like. I didn't make any changes to my gratitude log the month though. The list view for the month works well there, as I need all the space for writing that I can get. 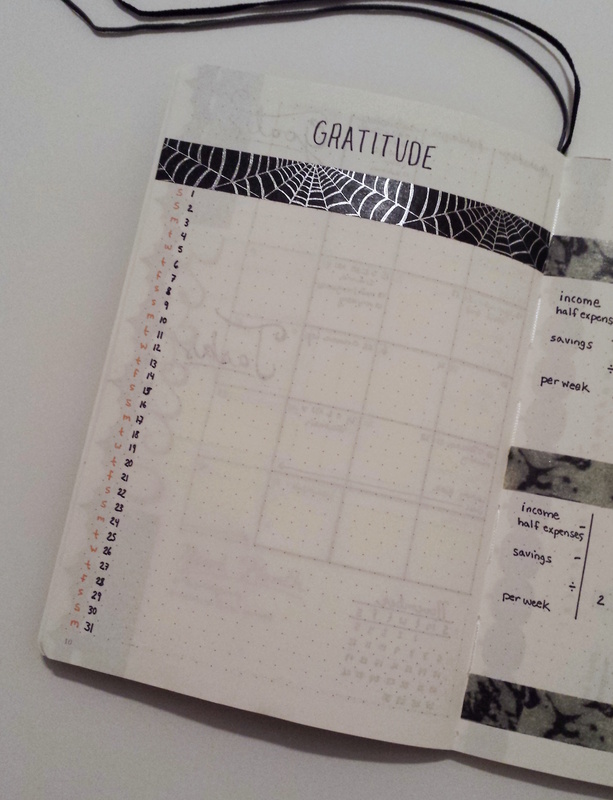 And even though I absolutely HATE spiders, I'm loving this cobweb washi tape. 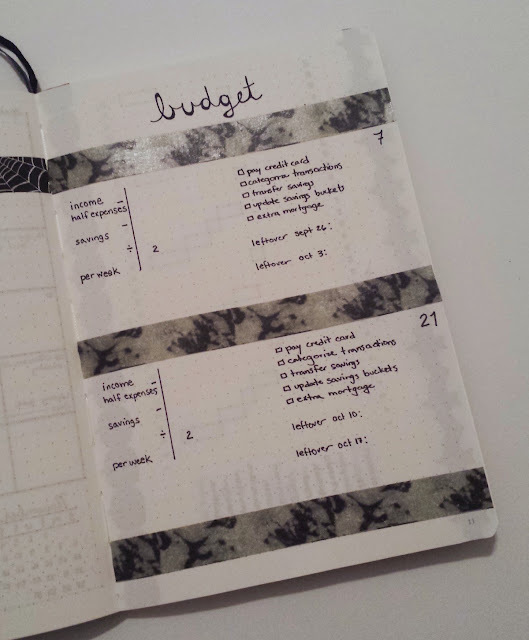 You're all pretty familiar with my Bullet Journal budget tracking pages by now. This month I made the areas for each paycheck a bit bigger and added specific lines for my leftover amounts after each week within a pay period. Remembering which weeks fall into which pay period can get confusing so I like how I have the dates already written down. Nothing new to see here, just some adorable glittery bat washi tape! One thing I'm going to focus on this month is incorporating my habit tracking more directly into my weekly and daily layouts. I'm starting to find that a single habit tracker gets kind of buried by the end of the month, which makes tends to make my habits slip from the forefront of my mind. But once again, the best part about a Bullet Journal is how you can morph it into what works best for you! 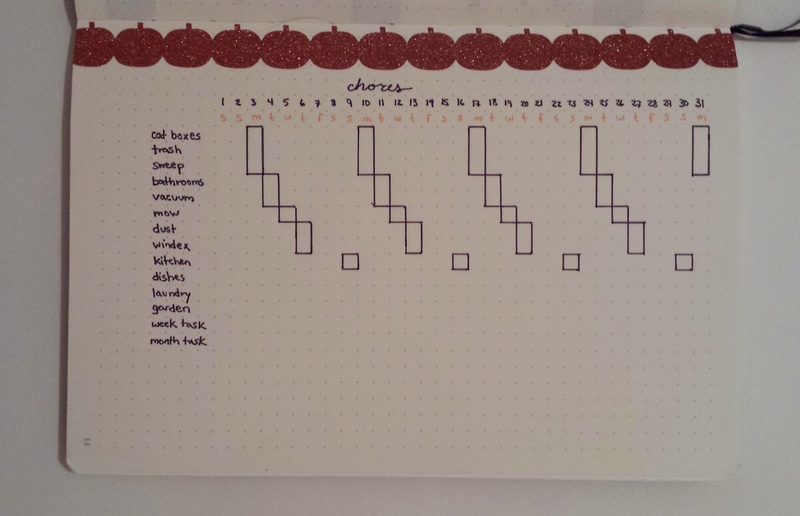 As for my chores tracker, this seems to be working quite well. Boxing in which chores I typically do on which days helps make keeping my house presentable almost entirely mindless. And there's even more festive glittery washi tape! I've kept it pretty simple this month, with only a few modifications from September's monthly layouts. I think I'm finally getting into a layout groove and it feels pretty satisfying! What do your new October Bullet Journal monthly layouts look like?